Réunion is an island and region of France in the Indian Ocean, east of Madagascar and 175 kilometres (109 mi) southwest of Mauritius. Ethnic groups present include people of African, Indian, European, Malagasy and Chinese origin. Local names for these are Yabs, Cafres, Malbars, and Chinois. All of the ethnic groups comprising the island are immigrant populations that have come to Réunion from Europe, Asia, and Africa over the centuries. There are no indigenous people on the island, as it was originally deserted. The predominant religion is Christianity, notably Roman Catholicism, with a single (Latin Rite) jurisdiction, the Roman Catholic Diocese of Saint-Denis-de-La Réunion. Religious Intelligence estimates Christians to be 80.9% of the population, followed by Hindus (10.7%) and Muslims (2.2%). 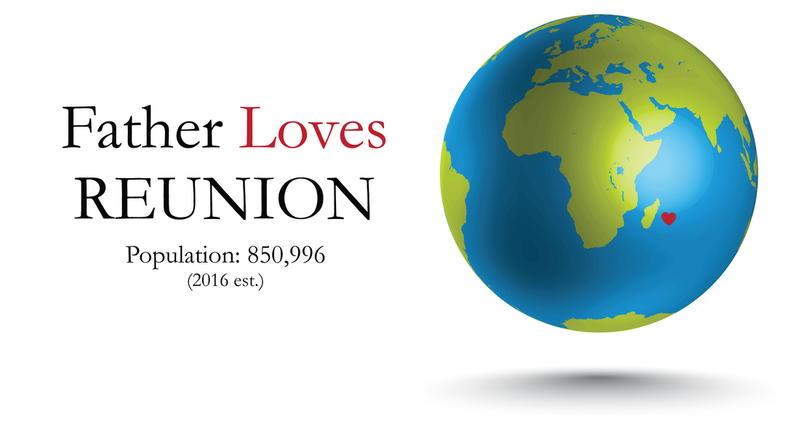 Father, I declare your love over Reunion and for everyone who lives there. I pray the good news of your beloved Son would reach every person on this island. I thank you Father that you have already poured out your Holy Spirit on all flesh so I am asking for the seeds of your love to bear much fruit in Reunion today. Father, I also ask that you would strengthen every believer in Reunion and impart to them a greater revelation of your love so they would truly know they are your sons and daughters. In agreement with your children who are praying this same prayer today, I declare the life changing truth that my Father loves Reunion!